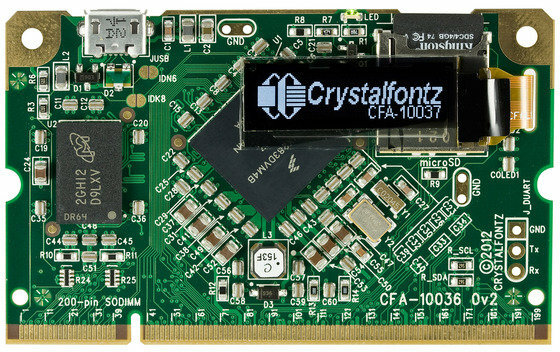 Crystalfontz America, a supplier of LCD and OLED display modules used in embedded systems, has launched a Kickstarter campaign to fund manufacturing and lower the cost of a system-on-module powered by Freescale i.MX28 featuring a small 128×32 OLED display, and lots of GPIOs. The company will also provide CFA-10037, a baseboard for CFA-10036 module, in order to ease prototyping. Freescale usually releases the full source code and provides great documentation for their processors. However I’ve heard several developers complain how the lack of mainstream support, and you always end-up with somewhat outdated kernels. This is exactly the case for i.MX28, as Freescale i.MX28 Linux port is still based on Linux kernel 2.6.x. This is why Crystalfontz has decided to ask Free-Electrons to create a device tree for the CFA-10036 under the current mainline kernel version 3.7. The platform will be mostly open as they will release the full schematic (PDF, PADS) and layout (gerbers, PADs) of the CFA-10037 baseboard, and release the schematic in PDF format for CFA-10036 as well as documentation of all the pin functions. It’s not fully open source hardware a la Olimex, but should be good enough for most projects. Buildroot and the kernel are available on Crystalfontx GitHub account. You can watch the Kickstarter video for an introduction to the board, and see what people may do with it. Prices do not include international shipping. If you want the board(s) to be shipped outside of the US, you have to pledge $1, then give your address before knowing the shipping charge, which is quite an unusual way to handle international shipping on Kickstarter.